Handheld fireworks and the Sonnetar 1.1/50. 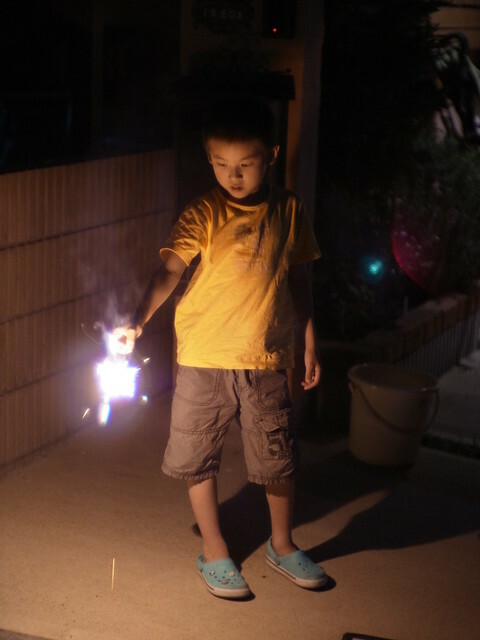 My son like small handheld fireworks, so I tried to take a photo with the Sonnetar 1.1/50. You can immediately notice the flare around the source of light, but also the ghost on the opposite side to the right. If I could get a point source I would be able to see if there is any coma, thus being able to see if the flare is an artifact of spherical aberration (which this lens has plenty) or coma flare. However, there is a coma adjustment ring on the back of this lens, and I have it set close to the distances in this picture. My aim was to subdue the coma as much as possible to get a more pleasant (to me) spherical aberration effect compared to the axially asymmetric coma. It's interesting how the spherical aberration causes the image to blur but keep the image at focus relatively sharp. The computer aided lens designs of today all aim towards optimizations with as little aberrations as possible, with the forefront being spherical aberration. Other prioritized aberrations are possibly chromatic aberrations. In any case, there is good reason, of course, to have a good handle on these aberrations since we can readily see them with today's pixel peeping. I do however, like to see lenses like the Sonnetar that have traces of aberrations that can be used to our advantage if handled in a way we see fit. If there is a way to quantify the "character" of a lens, it may be possible by pursuing the aberrations of classical lenses, and not strictly the optical performance.